Sleep. So important for mom, baby, for the whole family. Sleep deprivation can lead to a lot of health problems and stress. It seems it is inevitable for moms of infants to be sleep deprived. It's true, most mothers will get little sleep the first year of the baby's life (and beyond). Yes, yes, listen to that advice of sleeping when the baby sleeps! Before I delve into the topic at hand, let me be perfectly clear that your family sleeping arrangements are your business, not mine. I do however get asked the 'cosleeping question' a lot and I felt it's important to address it. Particularly because there is so much misinformation out there regarding cosleeping. Let's rewind for a minute here. Babies have been sleeping with their mommies for thousands of years. Read that sentence again. Cribs on the other hand, are a fairly new phenomenon. While cradles have been around for a while, and swinging motion sleeping contraptions for babies have been used to lull them to sleep in many parts of the world, the stationary, solitary, motionless crib is only a couple of hundred years old. It is an entirely western phenomenon. Especially the idea of a baby sleeping in a crib in a separate room from the parents. I'm not an expert, I am just a mom who follows her intuition when it comes to mothering - not books, magazines, or so called 'parenting experts'. Nobody knows your baby better than you. Here are some reasons why we decided the crib wasn't for us and cosleeping just feels right and natural. We had a crib ready to go with our first, but it just didn't work and was useless for our family. 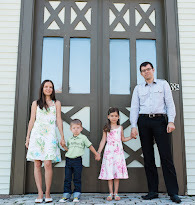 Of course that doesn't mean a crib is wrong for every family, but it is for ours. If you're looking for a compromise in between, an Arm's Reach Cosleeper is always an option. Safety is the biggest reasons many shun cosleeping. I'm here to set the record straight! Cosleeping is not safe when it is mixed with drugs, alcohol, or smoking. A lot of things are not safe in combination with those! None of those are a problem in our family, so it's a non issue. 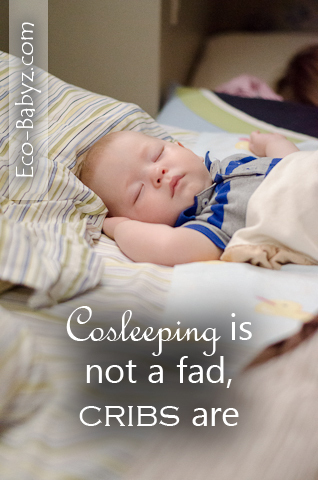 Cosleeping is also not safe with excess soft bedding and sleeping surface. We don't sleep on couches, we don't have extra pillows, we have no polyester in our beds (a non-breathable synthetic material). Keep in mind that babies should only cosleep with the mother as moms have a special symbiotic connection for feeling how the baby sleeps. In certain circumstances babies past infancy may also safely cosleep with the father, but never with other caregivers. During an eight year period of a study during 1990 to 1997, there were about 34,000 total SIDS cases in the U.S. The percentage of SIDS cases that occurred in an adult bed is only about 1.5% of the total. So that means that 98.5% of deaths happened where? That's right, in cribs or elsewhere. Not in a safe cosleeping arrangement. You may have seen the national ad campaign about the 'dangers of cosleeping'. Guess who is co-sponsoring it? That's right, the JPMA (Juvenile Products Manufacturers Association). They benefit directly from as many parents as possible buying cribs for babies. Conflict of interest anyone? Moreover, cosleeping studies worldwide clearly show a trend of virtually non-existent SIDS cases in countries where cosleeping is the norm. In Japan where co-sleeping and breastfeeding (in the absence of maternal smoking) is the cultural norm, rates of the sudden infant death syndrome are the lowest in the world. For breastfeeding mothers, bedsharing makes breastfeeding much easier to manage and practically doubles the amount of breastfeeding sessions while permitting both mothers and infants to spend more time asleep. Moms, sometimes they 'just know' what works well for their kids. A crib may feel right for some parents, fine by me. But for us cosleeping is just perfect. Everyone is happy, everyone is safe, and we all get the most sleep that way. Not to mention nursing is a piece of cake. I love not having to get up in the middle of the night. We also know that our babies will grow up so fast. Obviously they will not sleep with us forever, we cherish the short time they are little and we can be so close. I remember myself as a child. For a long time I didn't like sleeping alone and I am thankful my parents took care of my need for comfort and allowed me to sleep next to them in the same room for the longest time. I understand my children's needs, moreover that of my younger baby. Even as an adult I would never want to sleep alone in a room, why should my children? Why should they be denied the comfort of a loved one being near them? There are numerous biological and neurological reasons babies should never sleep alone. Oh, and I'm totally with Annie from PhD in Parenting on why cry-it-out doesn't work for us. Proponents of cribs and the cry-it-out method often mention that cosleeping is bad for babies because it makes the 'dependent' and they will never learn to sleep on their own. Research actually confirms the opposite. Solitary sleepers have actually been found to be more dependent on their parents than cosleepers. In a study of children ages one to seven years old that all sucked their thumbs, 96% of them had been left alone to fall asleep as infants. There were no thumb suckers among a large group of children who had physical contact with an adult while falling asleep. Cosleeping boys ages 3 and older were shown to have no greater difficulty separating from one or both parents that solitary sleeping boys. Research has found that solitary sleepers are far more likely to use a security object than cosleepers. Children use security objects as substitutes for nighttime human touch. What do we teach our children when we teach them to rely on objects rather than people for soothing? It has been theorized by psychologists that children who grew up in family beds were insecure and needy, but recent research (below) proves without a shadow of a doubt that this is simply not true. Children who never slept in their parents' beds were harder to control, less happy, had more tantrums, handled stress less well, and were more fearful than routinely cosleeping children. Cosleepers show a feeling of general satisfaction with life. Children who didn't cosleep end up getting more professional help with emotional and behavioral problems than cosleepers. Boys who slept in the family bed had increased self-esteem and less guilt and anxiety. Girls had more comfort with physical contact and affection. Children who had coslept felt they weren't as prone to peer pressure as others their age. Sleeping together as a family gives me the warm fuzzies. Let's admit it, life is hectic, non-stop, sometimes chaotic. We feel it is a great privilege to share our sleep with our babies and moreover the moments that happen before and after that sleep. We don't always fall asleep at the same time as the kids (we need some alone time too! ), but we usually wake up together and those are the best moments of our days that we will always cherish. Co-sleeping encourages family closeness and that has been confirmed by the research outlined in Good Nights, the vast majority of family bed graduates and their families report that they are incredibly close to their family. Contemplating cosleeping? Here are some tips to do it safely. Do you cosleep or prefer the crib for your babies? My Best Friend Will Be a Mom! I loved the non-judgemental feel of this post. You made it clear that you were doing what was right for you and not slamming the other side. However, I think it is malarkey what you included at the end about psychologists theorizing that "Children who never slept in their parents' beds were harder to control, less happy, had more tantrums, handled stress less well, and were more fearful than routinely cosleeping children." ??? I don't buy that at all and think it detracts from the positive points in your article. The rest of your post was well done and presented great info, I just think that last bit will get people's backs up and is not needed in your post. Thank you for your comment! I think you misread those couple of sentences. The only theory part is this sentence "theorized by psychologists that children who grew up in family beds were insecure and needy", then I go on to say that "research proves without a shadow of a doubt that this is simply not true" and I follow with the findings of the research. So this: "Children who never slept in their parents' beds were harder to control, less happy, had more tantrums, handled stress less well, and were more fearful than routinely cosleeping children" is just part of the sleep research that was conducted and quoted in the Good Nights book, NOT theory. Well, I guess I just disagree with their research then. I truly don't believe that co-sleeping or NOT co-sleeping creates benefits or trouble for kids. I don't think kids who co-sleep are more confident nor do I think they are more clingy etc.... I think kids with loving, involved parents are the ones who thrive and that can work with all parenting types. I am actually for co-sleeping. I stand by my statement though that, to me, it just detracts from your post. But it's not my blog. LOL! Couldn't have said it better! Great post! I actually prefer both. He sleeps in his cirb (same room) the first part of the night. I need some room to myself. If he wakes up, he usually won't sleep unless he's in bed with me. But what I think is funny how he kicks me out of my bed and he's only 2 months old! I always have bruises on my legs from my almost 3 yr old coming to sleep in our bed. Our 3 girls (5, almost 3 and almost 1) supposedly share a bedroom but most mornings I wake up with 2 or 3 of them in our bed. I'm not sure why we've had a crib set up for all 3 of our kids because it sure doesn't get used much! Our 5 and 2 yr olds share a double bed and our baby sleeps with us (except my 2yr old only sleeps half nights in her bed then sneaks i our bed). I love this post! I have been co-sleeping from the beginning. My little one is 13 months old and I wouldn't change it for the world. I agree that we need to stop judging people for the choices. At the same time, we need factual information about co-sleeping. I was attending a prenatal class and was the only person interested in co-sleeping. Everyone was so afraid of it-yet so many cultures practice it. As well, it makes breastfeeding so much easier! We co slept with Baby A until she was 10 months old through the whole night, halfway through the night at 1 year old, and now she comes into bed for the last hour or two. She likes to fall asleep on her own, but she needs the comfort of knowing we are there. We practice the safe co sleeping guidelines and have pillows surrounding the bed although never once has she fallen out. She sleeps best with us, but she is almost transitioned to her crib now at 17 months old. I don't know about having crib and out mattress on the floor, i know my husband would disapprove this idea. Of course everyone has their preferences, when i personally prefer kids sleep separately, however i do nurse to sleep when my 16 month old wakes up. We still have our older kids 5 and 8 year old trying to sneak in bed sometimes, so yeah no matter where kids sleep they end up in your bedroom on your bed at some point until they grow up. My hubby and I sleep much better when my kiddos are in their own beds in their own rooms. I did co sleep for the first few months of their lives out of survival though, lol. My boys share a room and once we put them together they slept much better. I really appreciated this! The only person who understands our cosleeping is my mom who did it with me! That's great to have some support from mom! I would say about 90% of my friends/family don't get it. You know what, in Japan they co-sleep with babies until like school age! :) That puts things in perspective! I love this article! I was against co-sleeping til i had my son now I totally Get It! We are safe and responsible about it, but we get tons of flack from friends and family for it. I loved this post in its entirety. I hate the bad vibes co-sleeping and bed sharing get. I have never slept better knowing my baby is safe beside me and it gives me extra time to stare at him and play with his wisps of hair and give him extra kisses. I do not have to get out of bed at night to check on him and I wake up to a happy, smiling baby every morning. Why are more people not doing this?! 2 years cosleeping with one on the way, always love to see it being re-normalized! My sister died from SIDS at 1 month old when I was 5. She died in a bassinet. No pillows or poofy frilly bedding. I can still clearly remember waking up to my mom's screams the night she died. I get so angry when I hear anyone blame SIDS on anything because nothing has been scientifically proven to cause it. I coslept with my son until he was 18 months and made it clear he needed his own sleep space, but he isn't turned away if he wakes up in the middle of the night and crawls in bed with us. He's 2 and his bed is in our room. I couldn't sleep if he wasn't close enough for me to check his breathing. I realize that it was paranoia based on traumatic experiences but children feel your stress no matter their age. We were happier as a family. I got more sleep. He got more sleep. And I have never had to wean him from thumb sucking or a pacifier. In fact he never really would take a pacifier. I wouldn't change a thing and plan to do the same worth the next. Years of practice all over the world hold far more knowledge than doctors who have only been beer pong free for 5 years. If I need to know what a child expert would say I only need to look at Dr. Sears.....a huge proponent for co-sleeping. So sorry for your loss Ashley, that must have been horrifying. My daughter is 5 and I can't imagine how she would feel if she lost her little brother. Thank you for sharing your experience with your child, I'm glad co-sleeping is working out for you. Whatever works for everyone to get some good sleep!